Teaching and modelling specific sentence structures each month gives students a strong foundation for writing. A daily oral language development time called "Les jasettes" presents the sentence structure with students in groups of 4-5 playing a game using that month's vocabulary theme. Our journals have a sheet pasted to the back cover that folds out. This page contains the child's personal dictionary. Most students begin the year with the same basic sentence structure prompts. Each group is headed by the classroom teacher or one of our 4 French assistants. 20 minutes is spent in small groups playing games based on a theme each week; food, winter, family and so on. For example; students pick a plastic animal out of a bag and they identify the animal using that week's structure. "Voici une vache. C'est noire et blanche." On Monday and Tuesday of each week the vocabulary is new and we provide many models. By Wednesday and Thursday the children know most of the vocabulary. 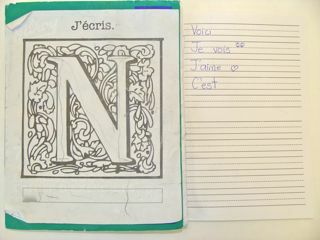 The following week we mimic those same oral structures in our journal and write "voici" and "c'est" sentences. As the year progresses words are added to each child's personal dictionary depending on what they have asked to have spelled and need to reference. The students consult words around the room or a visual dictionary.